Water and sewer take decades for return on investment, and roads and bridges probably aren't any better. That's worth remembering whenever solar, busses, or trains come up. The cost of one mile of construction for water takes 23 years for a return on the initial investment; sewer takes 21.3 years. The VDT didn't specify the similar return times for road paving or bridge construction, but it's a safe bet they're at least as long. The farther water or sewer lines or roads or bridges are from population centers, the more they cost both directly in installation and indirectly in trips for fire and sheriff vehicles, and especially school busses. The county commissioned a report on that several years ago, as Gretchen reminded them last year. In the particular rezoning case on Cat Creek they were discussing then (Nottinghil), they made a decision to table which seems to have caused the developer never to come back with that particular sprawl plan. I congratulated the Commissioners at that time, and I congratulate them again on not promoting sprawl. 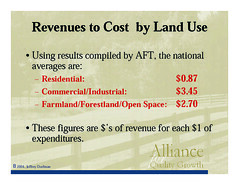 Sprawl costs the county, payback takes years, and longer the farther out it goes. What if we did something different? More on that later. They're back! Seems like this would normally be a rezoning consideration meeting, but there are no zoning cases on the agenda. Not even Nottinghill on Cat Creek Road. 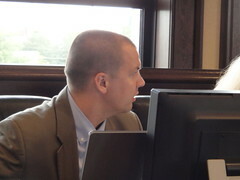 WORK SESSION, MONDAY, AUGUST 8, 2011, 8:30 a.m. 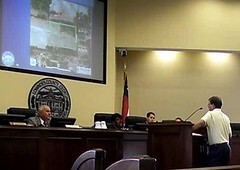 REGULAR SESSION, TUESDAY, AUGUST 9, 2011, 5:30 p.m.
Newsflash: Lowndes County Commission does right thing about rezoning! 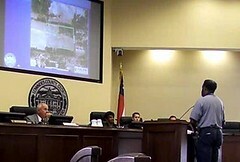 Commissioner Raines expressed puzzlement as to what to do about rezoning for Nottinghill on Cat Creek since he thought the previous day that there was a deal between the developer and the neighbors, but it turned out there was not. Commissioner Powell recommended tabling until next meeting so the developer and the neighbors could try again to work something out. Commissioner Richard Raines thanked Nijem for sitting down with the neighbors. Bill Nijem, representative of the applicant, brought forward information demonstrating his client’s willingness to work with neighbors, in that lot sizes were increased by 20 percent and that the average lot size would range from a minimum of 12,000 square feet to 20,000 square feet. Nijem also reminded commissioners that the applicant was willing to install any necessary buffers or fences to prevent children from playing in the neighboring fields and would have water and sewer installed with his own financial resources. If somebody puts a subdivision next to your field, beware of trash, and the same if you buy a lot in it. For that matter, why do we need more houses? To expand a little bit on that subdivision next to our west field, one of the builders continued to push trash into our field until I had to sue him for trespass in Superior Court to get him to stop. I meant to say in Magistrate's Court. I called code enforcement multiple times and they did nothing to help stop it. Now that there's a new fire chief perhaps things are better, but anybody who's got a field nearby might want to watch for that. Anyone who hopes to buy houses in the subdivision might want to watch to see if there are any dumpsters in there, because the subdivision near us, the trash was buried in the yards; you can ask anyone who owns one of those lots. As far as needing houses for Moody, there are usually ten houses for sale in that subdivision, and roughtly 10 or 15 more that are for rent. So it's not clear we actually need more houses. Gretchen Quarterman also spoke against the proposition, citing that extending residential areas further out into undeveloped Lowndes County would create greater strain on an already tight fiscal operating budget. Schoolchildren, safety, and farmland: three topics that often seem forgotten in discussions of development. 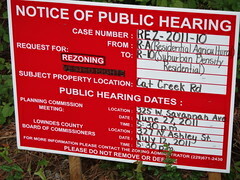 Opposing the proposed rezoning for Notthinghill, neighbor Thomas E. Stalvey Jr. noted that traffic on Cat Creek Road is already a problem, and adding a subdivision would make it worse. He noted that it's traffic routed down Cat Creek to Moody that accounts for a lot of it. He said school children stood out on the road and they were already in danger. Somebody finally called a developer's bluff! Answering Commissioners' questions about his opposition to rezoning for Nottinghill on Cat Creek Road, Calvin Marshall did what I've never seen anyone do before in opposing a subdivision: he upped the ante. Seems fair, except that he seemed to be talking about each individual eventual property owner having to put up a fence, and I can tell you by experience that that won't happen without the neighboring landowner personally insisting to each lot owner. Unless the Commission insists that county code enforcement actually enforce such a condition, which would be a good thing for a change. 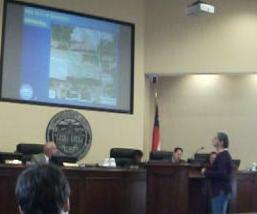 Neighboring landowner demolishes developers' arguments; explains agriculture to Lowndes County Comission. That last one is presumably Glen Laurel, which had a roomful of neighbors opposing it last year. Calvin Marshall asked for the Commissioners to deny the Nottinghill rezoning request. “The other thing that we asked the developer ... what you going to do about the neighbors that have got a farm on each side? What kind of buffer are you going to put there? We farm that land, we grow crops, we run cows, we run goats, we run hogs, and we're going to continue to do that. “There's three or four generations of property owners in this room tonight. These people go back for three or four generations. And these people have worked hard. County Planner Jason Davenport introduced REZ-2011-10 Nottinghill, Cat Creek Rd, 0144 0255-0258, ~15.75 ac., 49 lots, Co W/S, R-1 to R-10. He said the TRC recommended approval with a condition, the Planning Commission recommended approval with a different condition, and now staff preferred requiring a minimum lot size of 12,000 square feet. Valdosta, Lowndes County, Georgia, 12 July 2011.